KUALA LUMPUR: These are exciting times in Johor, especially with the blossoming of Iskandar Malaysia, a development region thrice the size of Singapore. 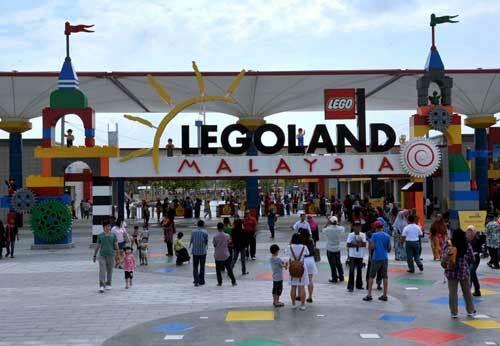 With the current school holidays in both Malaysia and Singapore, it is not uncommon to see school children and their parents packing the two international standard theme parks that had just opened in the development corridor. Hello Kitty Town, the first Sanrio Hello Kitty theme park outside of Japan, and Legoland Malaysia, the two flagship leisure attractions of Iskandar Malaysia, offer a lot of fun rides, walk-through attractions and interactive activities. And not forgetting the Johor Premium Outlet (JPO) as well. Iskandar Malaysia, measuring 221,634 hectares of land, covers the entire districts of Johor Baharu, Mukim Jeram Batu, Mukim Sungai Karang, Mukim Serdat and Kukup Island in Mukim Ayer Masin, all within Pontian district. Since its launch in November 2006, the economic corridor has been receiving lots of foreign interest, not only from neighbouring Singapore but also from as far as the Middle East and the United Kingdom. But humour aside, he said, 2012 was the tipping point year for Iskandar Malaysia because a significant number of catalytic projects were completed and began operations. Syed Mohamed said Iskandar Malaysia was once considered too risky to invest but it was now buzzing with vibrant economic activities unseen in the history of not only Johor Baharu, the state of Johor but also the nation. “This has been possible principally because of the completion of major infrastructure linkage projects under the Ninth Malaysia Plan and also complemented by the completion and commencement of operations of catalytic projects such as Puteri Harbour, Educity and Legoland and Hello Kitty theme parks. The government has listed six targeted service-based sectors in the creative, education, financial advisory and consulting, healthcare, logistics and tourism industries for Iskandar Malaysia. Recently Prime Minister Datuk Seri Najib Tun Razak said he was pleased that Iskandar Malaysia had surpassed the RM100 billion investment target within six years and the bulk of that sum came in recently. He had also said in jest that if Singapore could be considered as New York, then Iskandar Malaysia could be seen as a New Jersey. By this, Najib has envisaged the kind of symbiotic development that he wants for Iskandar Malaysia in the future, especially in light of the development of New Jersey, which has boomed within the sprawling metropolis of New York and Philadelphia in the north-eastern coast of the United States. That same feeling was echoed by MIDF Research Chief Economist Anthony Dass: “We see Johor as a booming state, we cannot directly compare it with Singapore. I would look at Johor and Singapore complementing each other rather than a head-on competition,” he said. With the kind of investments that Iskandar Development has been attracting, Johor would stand to benefit, he said. “We are looking for strong growth for Iskandar Malaysia next year and in 2014. More new investments are expected in terms of retail investment, services as well as manufacturing,” said Dass, adding that there has always been a strong appetite from Singapore companies to invest in Johor because of its proximity. Iskandar Malaysia is also attracting headline investments like the one announced by Singaporean tycoon and car enthusiast Peter Lim to develop Motorsports City in Nusajaya which will comprise vehicle showrooms, automotive retail outlets, workshops, a 5km test track, a go-kart track and other automotive-related trades and activities. He cited rising cost of construction and a tightening labour market in Singapore as reasons for banking on Johor. For investors like Lim and Tan Sri Barry Goh, Executive Chairman and Managing Director of B&G Capital Resources Bhd, who recently signed a lease agreement with Iskandar Investment, they will not stop at what they had bought. They are still eyeing more of the action in Iskandar Malaysia. Najib also remarked that there had been growing trend among Singaporeans now living in Johor Baharu and commuting to Singapore for work as well as Singaporeans commuting to Iskandar Malaysia for studies. “That’s a very interesting development because this never happened before,” he said.